VENUE : Marwadi University Campus. We believe in a balanced and healthy development of our students, as a result this fiesta is carved out in such a way that it has a proper blend of both academic and non-academic events. These three days have been scheduled in such a way that participants would have an ample opportunity to showcase their talent and creativity. 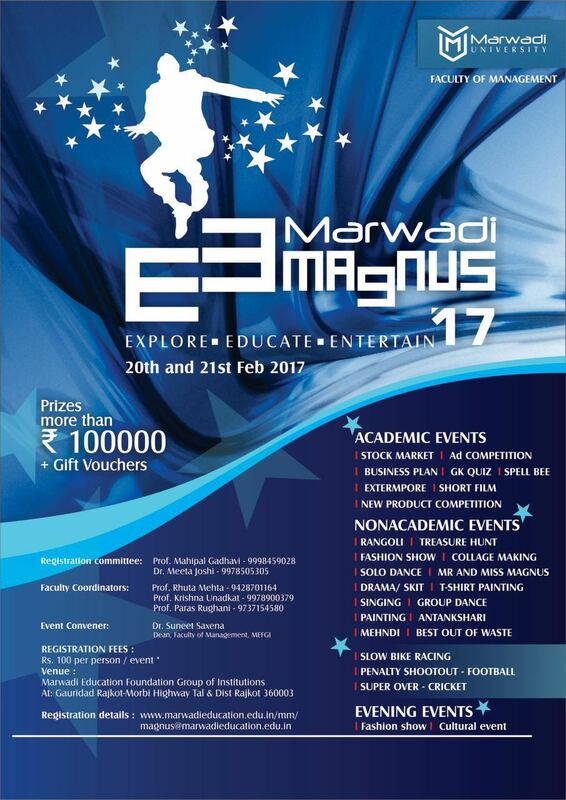 MAGNUS 2017 comprises of academic events like Stock market, Ad Competition, B-Plan competition, Business Quiz, Extempore, Short film, Spell bee and GK quiz wherein students can demonstrate their professional competency as a budding manager. The non-academic events encompass Rangoli Competition, Collage making, Best Out Of Waste Competition, Solo Dance, Group Dance, T shirt Painting, Face Painting, Antakshari, Mime, Treasure Hunt, Fashion Show and Mr. & Ms. Magnus which provides entertainment along with scope to exhibit creativity. These two days would offer you two workshops which can be attended by participants/ visitors free of cost depending upon their interest. We promise you challenging days which would test your business acumen, creativity, dancing tunes & gala time on both the days with loads of poppy music, and unimaginable fun. We assure you the best of the experiences and hospitality. It’s a Must attend event for youngsters. An opportunity not worth missing! We have special attractions like Super over , slow biking and penalty shoot out.. Non Academic Events : Rangoli Competition, Treasure Hunt , Fashion Show , Collage making,Solo Dance, Mr. & Ms. Magnus, Drama Skit , T shirt Painting , Singing , Group Dance, Painting , Antakshari , Mehndi , Best Out Of Waste Competition, Slow Bike Racing , Penalty Shootout ,Football , Super over - Cricket. Date : 20th and 21st Feb , 2017.